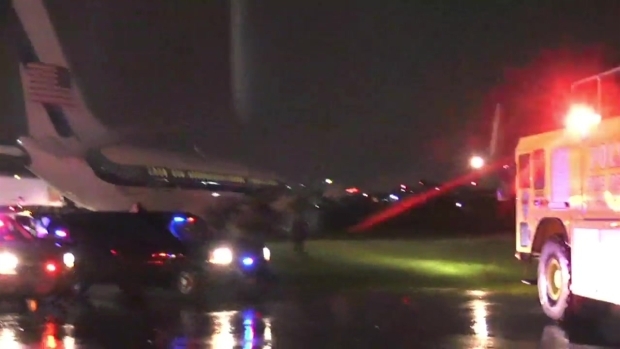 Vice presidential candidate Mike Pence's campaign plane slid off the runway after landing at LaGuardia Airport Thursday evening, tearing up two tracks of concrete before coming to rest on a patch of grass. The governor was checked to make sure he was OK, but no injuries were reported, according to an NBC campaign embed on the scene. Port Authority emergency responders were on the scene within seconds, and LaGuardia Airport was closed for over an hour while authorities investigated. The Boeing 737 plane, which was coming from Fort Dodge, Iowa -- about a three-hour flight from New York -- overshot a runway and made a rough impact when it landed shortly after 7:30 p.m., according to officials. The pilot slammed on the brakes and travelers could smell burning rubber. Flights have resumed at LaGuardia Airport but many travelers were delayed following the Pence plane's skid on the runway. Ray Villeda reports. NBC campaign embed Vaughn Hillyard said on MSNBC later that the Pence plane has often had hard landings, "but in this one we hit hard, bounced for a couple seconds, then took a hard swerve to the right. "We didn't realize fully what was happening up until the point that the campaign plane came to a complete stop, and you can see the road is 100 yards away from where the plane was -- we're off the tarmac," he continued." "Because we were at a complete standstill and we're with the vice presidential canddiate -- we felt we're all right. And everyone was fine," said Hillyard. "The governor came quickly to see if everyone was OK. Everyone was fine." Passengers, including Pence, exited through the back of the plane. Pence was seen shaking hands with firefighters and emergency responders on the ground before getting into a car and leaving the tarmac. None of the 37 passengers and 11 crews on board the charter plane were hurt, according to Port Authority officials. Arrestor beds -- crushable concrete material that are installed at the end of runways and designed to slow down an aircraft overrun with no human injury and minimal damage -- "did its job" and stopped the plane, Port Authority officials said at a news briefing. Campaign spokesman Marc Loetter told reporters that Pence had missed his fundraiser in New York City and was headed to his hotel for the night. 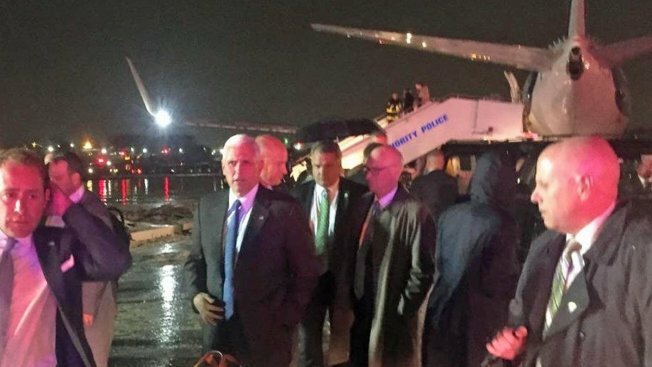 Vice presidential candidate Mike Pence's campaign plane slid off the runway after landing at LaGuardia Airport Thursday evening. Pence tweeted shortly afterward, "So thankful everyone on our plane is safe. Grateful for our first responders & the concern & prayers of so many. Back on the trail tomorrow!" Pence was scheduled to appear on MSNBC's "Morning Joe" Friday morning. After closing the airport for about an hour after the incident, the Port Authority reopened one of the two runways at the airport. The other runway will remain closed indefinitely pending clearing of the aircraft. The FAA and the NTSB are investigating. In March 2015, a passenger jet carrying 127 passengers skidded off a runway at LaGuardia Airport and crashed into a fence as it tried to land amid a blinding wintry mix. Pilot error was blamed in that skid, with federal investigators finding the pilot used too much reverse thrust and lost control of the plane's direction. Earlier this week, a study by the Bureau of Transportation Statistics found that LaGuardia was the worst performing airport in the country. It is currently undergoing a multi-billion dollar renovation.